Having been unlucky enough to not have heard any of Pristine’s remasterings of the Schnabel Beethoven sonatas, I now catch the label on the back end with the issue of the bagatelle recordings. These were taken, I am informed, not from 78-rpm discs but from the “Great Recordings of the Century” LP transfers, two series from the early 1960s and the third from 1982, which remastering engineer Andrew Rose says had much less surface noise than their 78 counterparts. I will take him at his word. Suffice it to say that Schnabel’s piano has never sounded so good. I was unlucky enough to start my Schnabel listening experience not with the GROTC LPs of the ’60s but with the rather thin and noisy transfers that Seraphim did of the Schnabel series in the 1970s. As for the performances, they still hold up surprisingly well, as of course do most of Schnabel’s sonata recordings. Just for interest’s sake, I compared his performances to the exceptional modern performances by Linda Nicholson on the fortepiano (Accent 24180). The comparison is extremely interesting. Both performers use the sort of quirky little rhythmic figures and occasional luftpausen that make this music come alive. One might almost point to Schnabel as the inspiration for Nicholson’s interpretation. If, in the end, I come down more in favor of Nicholson, it is not because of the modern digital sonics but due to the astonishing range of color she is able to draw from her instrument. Using the damper pedal to creative effect, Nicholson evokes an astonishingly varied array of sound colors from her instrument, which make the varied strands of the music emerge in a more interesting way. I also prefer her album because it contains extra pieces, such as the Andante favori, Alla Ingharese Quasi un Capriccio in G, and two of the Klavierstücke (WoO 60 and 61), which the Schnabel disc does not. That, however, is not an indictment against Schnabel. At least five generations (if not more) of Beethoven pianists are either in his debt or in his dust when it comes to Beethoven. Although several later pianists excel him in certain individual sonatas (among them Egon Petri, Friedrich Gulda, John O’Conor, and Craig Sheppard), he was, and remains, the most consistent Beethoven pianist in terms of his long-range vision of the sonatas. 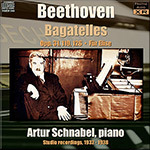 As for the bagatelles, they are “extras” in the catalog of the composer’s piano music, delightful excursions not to be missed, but not on the same high level. Yet when performers of great imagination such as Schnabel or Nicholson take them up, the results can be, and usually are, very close to magical. Needless to say, Pristine’s restoration of Schnabel’s piano tone—with the sole exception of the distantly recorded 1932 “Fur Elise”—is absolutely remarkable. The instrument has consistently more body to it, and overall the recordings sound more like the late 1940s.